Online Sequencer Forums - Limited Event: OS Present Wrapping! Online Sequencer Forums > Online Sequencer > Events > Limited Event: OS Present Wrapping! 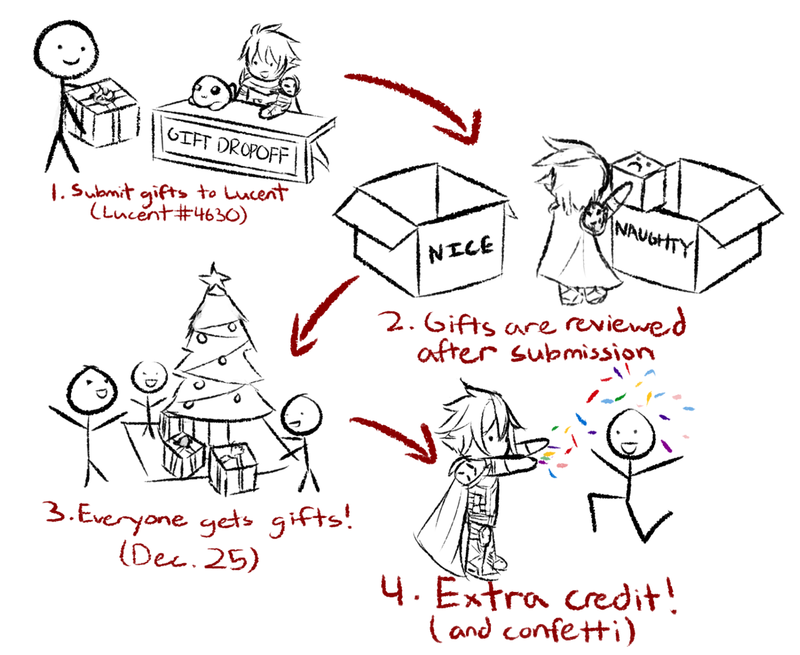 Full Version: Limited Event: OS Present Wrapping! It’s that time of year to spread some of that Christmas spirit! Got someone on OS that you want to send presents to? Want another opportunity to win points? Need to spread your love and appreciation for George Burdell? Don’t care but you’re reading anyway? Great! I’ll go ahead and knock out the event details. The entry period is from 12/1 ~ 12/24 (11:59 PM EST). Submissions and winners will be announced on 12/25! This is an event where you can compile a gift to send another person on OS. The gift can be anything— a sequence, a thank you letter, a drawing, something you made IRL, dead memes, just anything as long it’s something you’re okay with it being viewed in public. There's no limit to how many gifts you send, though keep in mind that the quality of gifts WILL matter when it comes to judging how many points a person will receive. Once you’re finished with your gifts, you’ll need to send it to me in private so I can keep it hidden under the Google Docs tree until Christmas. You can submit your entries through my Discord (Lucent#4630) or use the OS Private Messaging system if for some reason you’re really insecure about using Discord. 1.) To make sure you aren’t posting any discriminating, family-unfriendly, or online dating material. 2.) To look for the best submissions on the list. Good submissions made with a lot of effort are eligible for extra OS points! If you’re not that crafty, you will still get 1 point for sending a gift per person (as long as I feel like you aren’t BSing the system). On December 25 (around 8:00 AM EST) I will post everyone’s Christmas gift on this thread. Save the date until then! Here’s a small visual flowchart for those who still don’t get it. Have fun with this everyone! Happy Holidays! (12-01-2018, 02:06 PM)Sosasees Wrote: [ -> ] What are OS Points? The whole event system uses OS Points to track who is going to win by the end of the year. This is the current leaderboard. We all need to spread our love and appreciation for George Burdell. How did you want it sent in private? (12-01-2018, 08:39 PM)Frank Wrote: [ -> ] We all need to spread our love and appreciation for George Burdell. I've sent my Present as OnlineSequencer PM to LucentTear. Was she the correct User to Send my Submission to? (12-08-2018, 12:11 PM)Sosasees Wrote: [ -> ] I've sent my Present as OnlineSequencer PM to LucentTear.